With my mom’s abundant peach harvest this year, I find that this chorus perfectly describes my current situation. While my brother has opted to eat on the order of 8 peaches a day, I’ve been looking for different vectors for peach consumption. In the past week I’ve made peach, rum, and vanilla topping for ice cream, and a peach and chili-cayenne barbecue sauce. Last night, I was attending an end-of-summer barbecue and I thought using these peaches to make a bruschetta would be nice way to whittle down my ever-ripening supply of this fuzzy fruit. To prepare, drain and dry tofu. Place in bowl and mash with hands or fork. Add in basil, lemon juice (2-3 tbsp), garlic powder and salt to taste. Drizzle in a small bit of olive oil. Mix until it gets a ricotta-like consistency. Halve peaches, and red onion. Brush with olive oil and place on grill for a few minutes – just long enough to get some nice grill marks. Once off grill, remove skins from peaches, and let cool in refrigerator for 1-2 hours. In a new bowl mix chopped peaches and tomatoes and minced onion. Add a light drizzling of olive oil and balsamic vinegar. Add honey, basil, salt, and pepper to taste. Slice baguette into half inch slices. Brush both sides with olive oil and place in grill to toast. If you don’t have a grill, a toaster or the broiler setting in your oven can work. Be sure to flip both sides, and toast until golden brown. 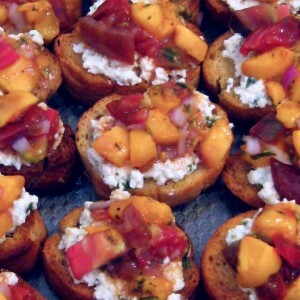 Spread tofu mixture on baguette slices, top with a spoonful of peach topping and serve. If you’re feeling especially ambitious, make a balsamic vinegar reduction and lightly drizzle over the assembled product.